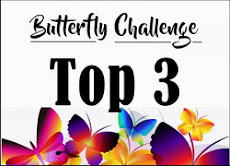 Welcome back to my Butterfly Challenge. Winners results for #82 are in the post below. Please make sure you check back as it could be you. Unclaimed prizes go back into the pot and there have been a few! Thankyou all so much for continuing to play along. 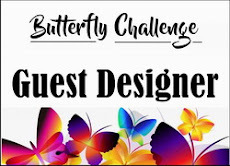 What a honor to be chosen as a Guest Designer for this challenge. 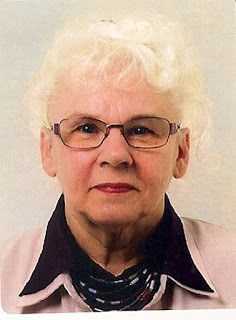 My name is Elly and I live in The Netherlands. I am married with Jan for almost 48 years and we have 2 beautiful daughters en 2 careful sons in law + 4 adorable granddaughters. I've been making cards for many years. I love all kind of styles [except "cute" for adults] and I always like to try something new. the letter J for Jagged Edge which has been teamed with K for the colour of Kiwi fruit. So I would like to see a jagged edge of some description. 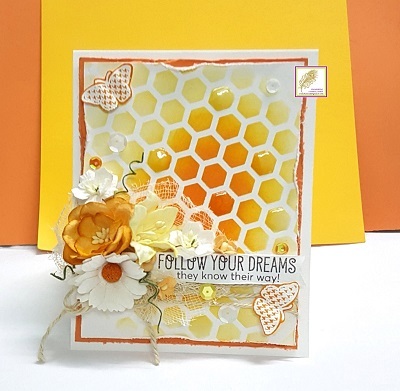 It can be the card shape itself or an embellishment on the card. Here is Elly's card for you. I love the bugs in the jar. Good job the lid is screwed on tight though! Please visit Elly on her blog Here for more details. Thankyou Elly for being my Guest Designer for #83. There were 35 entries for the Matching pairs challenge. Thankyou all for continuing to play along . It was nice to see some old faces back amongst the players. But in the end these are the three that I kept coming back to. I just found this card so soothing to look at with that beautiful background. Totally the other end of the scale but I love the vibrancy of this card. 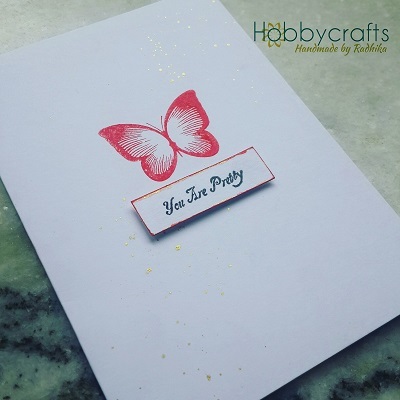 This card blew me away with the little butterflies inside the large one and so delicate too. spoilt for choice with butterflies, acorns, cherries and bows. Congratulations Lia. You last won nearly 2 yrs ago now. Hope to see you all back in # 83. 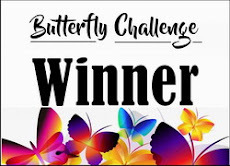 Welcome back to my Butterfly Challenge. 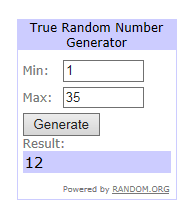 Winners results for #81 are in the post below. Please make sure you check back as it could be you. Unclaimed prizes go back into the pot and there have been a few! Thankyou all so much for continuing to play along. Hi. 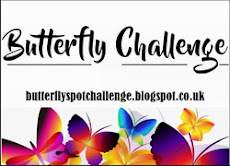 I was delighted to be invited as Guest Designer for the Butterfly Challenge #82 . I am married with five sons, seven grandchildren, five of them boys, and two great-grandsons. But since 2009, Chris and I have lived in Andalucia, S.Spain, and our family consists of three dogs and four cats, all rescued animals. I have been crafting in one way or another all my life, but since my retirement in 2007 it has become my main hobby. I started in papercraft with stamping and then was so excited to discover heat embossing! Now I love incorporating die cutting, and making my own cut-outs with my Silhouette Cameo machine. I mostly make cards for personal use, but also dabble in scrapbooking, knitting, crochet, lace-making, and also photography. I follow online tutorials to improve my skills and I love to learn about new materials and techniques on the internet, and usually try them at least once. So I am looking forward to seeing what techniques you have used for this challenge. the letter M for Matching Pairs which has been teamed with O for the colour of Orange peel. So I would like to see matching pairs of some description. It can be in the embellishments or a stamped image. Please state what your matching pair/s are. 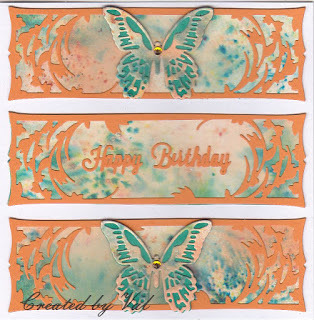 Kate has chosen two matching Butterflies for her embellishment. Please visit Kate on her blog Here for more details. Thankyou Kate for being my Guest Designer for #82. My matching pairs are the butterfly transfers, yellow side panels and buttons. There were 23 entries for the Key themed challenge. Thankyou all for continuing to play along . Three new players joined in again so welcome. Isn't this the most delightful little Mini journal. Such a lot of work has gone into making it . Please do go and have a look as you will not be disappointed. I love how Jenny has incorporated all the elements. 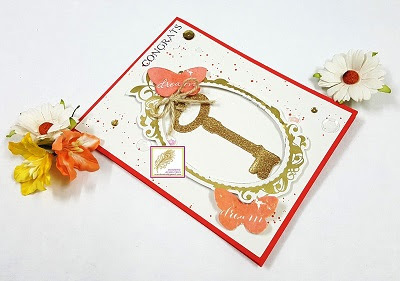 Key, Vermillion and not forgetting the butterflies of course!! With this pair of terrific bookmarks. 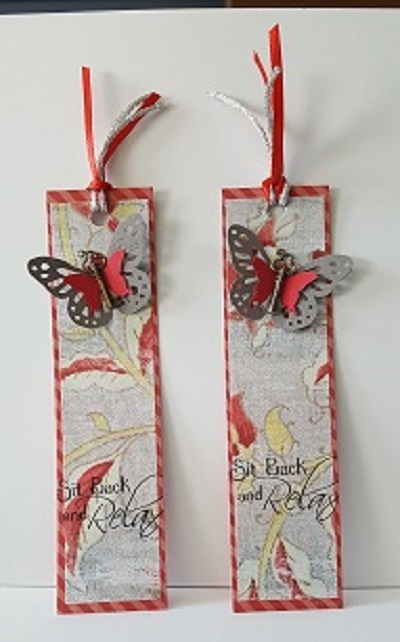 I love how terrie has used the keys as part of the butterflies bodies. Can never have enough bookmarks. 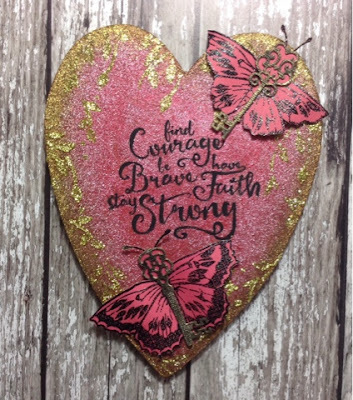 Very much into mixed media at the moment so I love this gorgeous sparkly plaque. Again I like the key element on the butterfly bodies. CAS but oh so striking. Hope you will come and play again soon. 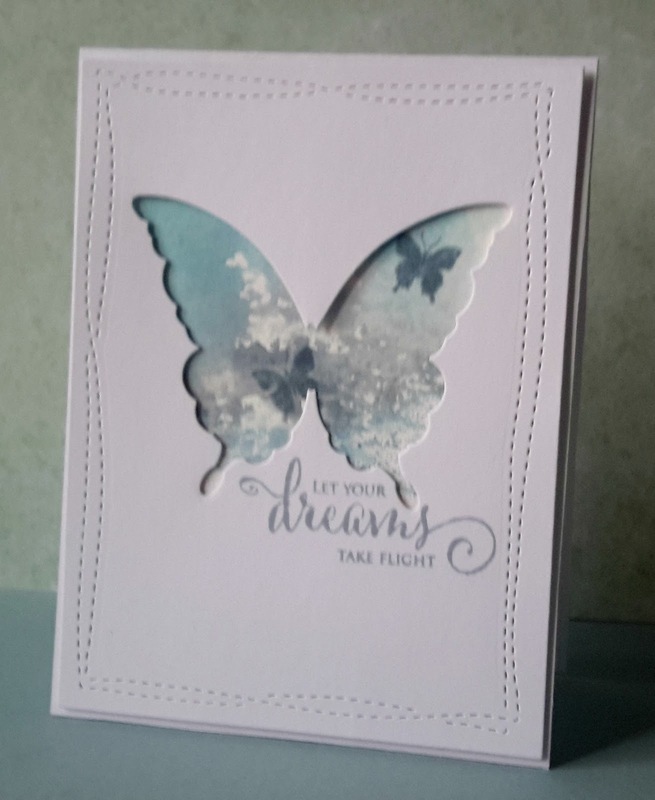 This card was completed in 20 mins start to finish which is some feat with all that heat embossing. Congratulations Mukta. I do hope you will come and play again. Hope to see you all back in # 82.